Competing Visions for Los Angeles – Suburbia, Citadel Urbanism, or a Landscape of Reinvestment? What was once a pinprick of a single private retail space masquerading as a “public” venue, the Staples Center, is metastasizing into a fortified island in Downtown LA. We shouldn’t be surprised at this. The city of Los Angeles has long been defined by its powerlessness against individual interests. It is that powerlessness that allowed the rise of the Red Car trams, a privately-owned infrastructure used by the “public.” While every other major city in America was funding its own infrastructural networks in the public good or pitting individual investors against each other, driving innovation through competition for the contracts for these infrastructures; LA was too weak to do anything but allow Huntington to roll out his rails (and the suburbs he built and they served) from San Bernadino to the sea. This left the LA metropolitan area with the form and arrangement it still cannot outgrow to this day. It is that powerlessness that failed to prevent the Huntington estate from acting in its own best interest forty to fifty years later and letting the Red Car system wither as each successive line grew too unprofitable. Had the city invested in the infrastructure the first place, and run the system for a profit, or at least solvency, it could have afforded to keep it to this day, and Los Angeles could have avoided its now legendary hellish traffic gridlock. The timely issue in question is the proposals new NFL football stadia. AEG’s proposal for a downtown stadium represents some of the the worst aspects of what has brought Los Angeles to the state its in today. There are other better options for the future, and those will be addressed as well. Wanting for major developments, but without the clout to realize plans of this scope itself, the city is continuing its tradition of flimsy opposition to individual interests. But are they giving a private interest carte blanche to tear down a piece of publicly owned infrastructure – the west hall of the Convention Center – and build a private profit-generating machine? This isn’t an argument for the existing West Hall, nor is a defense thereof. But this is a call to task of the conventional logic of the LA city “planners” willing to stand idly by while the citizens get an at-best-break-even deal and subsidize AEG’s corporate profits…. We’ll return downtown, but we have to go to suburbia to find the worst “Los Angeles” stadium proposal. So, with existing public transit links, 1/5th the footprint, and only grass on the field, let’s entertain the possibility that AEG’s proposal for a downtown stadium complex is a better idea than the City of Industry proposal. AEG’s proposal replaces the existing West Hall of the Convention Center, and the new facility is planned to actually upgrade the amount of convention space. In objective terms, this isn’t that bad. The issue is twofold: the further fortification of a citadel of private capitalization disguised as public space, and the short-sightedness of the proposals. The City of Los Angeles owns and operates the Convention Center. LA Live and the Staples Center are already listed as “in partnership” with the city on the Convention Center already, I assume this means the owner of the LA Live and Staples, Anschutz Entertainment Group. AEG is spending $1 billion on their stadium proposal, and getting the city to spend $300 million on renovations to the Convention Center. Is AEG buying this land from the city? What kind of deal are they getting? I hardly believe that AEG would build this thing privately and hand over operation of their facility back to the city. Does this mean getting the site at a sweetheart price from the city, tearing down previously-city owned infrastructure, replacing it with a private facility, and renting it back to the city at whatever rate they choose? I can’t find any evidence to support nor refute this, but I doubt AEG is doing anyone any favors, so I assume the city are the ones bending over backwards… Otherwise, AEG could just say they’re taking their football (stadium) and going somewhere else. While most of the the renderings are quite nice, none of the AEG stadium proposals are worth discussing architecturally. They are unimaginative and uninspiring. Their stance on urbanity is regressive at best. This facility could be a magnet of future development and capital investment, but instead it’s thrown up to complete a wagon-circle formation, bayonets out to the city at large, with AEG’s other properties, LA Live and the Staples Center. Facilities like these could be used as a network to create zones between enriched by their proximity to multiple entertainment venues. Let’s look at a proposal put forth many years ago by a classmate and friend of mine, Daveed Kapoor, now director of Utopiad.org. 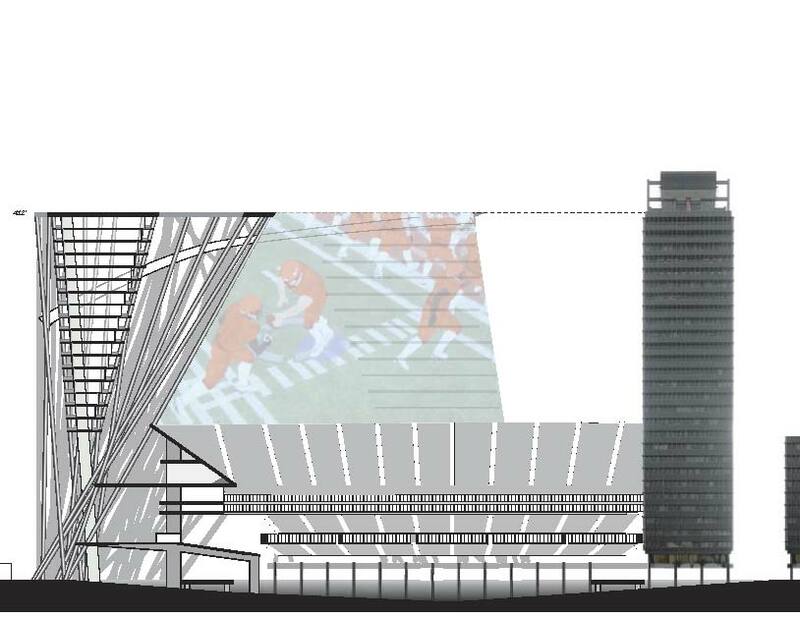 Daveed’s proposal (.pdf here), which dates from 2002-2003, uses the former Transamerica Center (now AT&T Center) as the eastern terminus for the stadium. 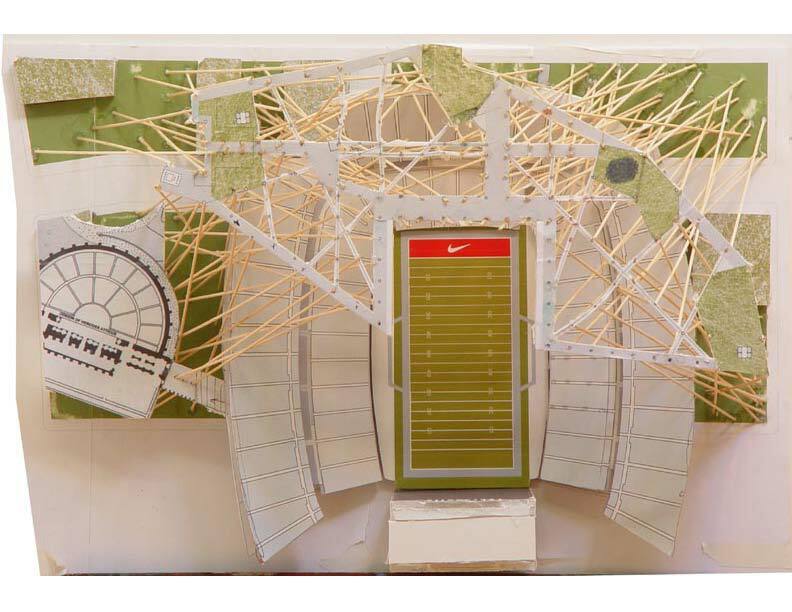 This dialog creates a previously unseen typology of stadium and skyscraper. It imagines the city not as a discrete series of individual buildings as capital archipelagos, emanating their power and influence outward in competing spheres; but as a landscape, creating friction in the interaction of various manifestations and stages for capital. In other words, the proximity isn’t just smart capitalism, but a boxing match between the means of capital generation. Standing tall in one corner, against an uncertain future, we have Insurance. And in the other corner, exploding like the flash of a running back through the a-gap, we have Spectacle. The instantaneous thrill of sport is contrasted with the slow and methodical accumulation of predicting the future. (…and now that the tower is AT&T’s landmark, rather than Transamerica’s, the potential for highlighting AT&T’s technological prowess to not only the spectators, or on the LA skyline, but to the watching world is embodied.) This dialog is both poignant and compelling. There are many exciting things about Daveed’s proposal, but it is germane here because, for those unfamiliar with Los Angeles geography, the four blocks that this birds-nest of a building would touch down upon are today mostly covered by privately owned surface-level parking for … tah-dah! The Staples’ Center, Convention Center, and LA Live. Daveed’s vision, in addition to being highly polemical and unique, was also visionary of the possibilities for the neighborhood. The AEG proposed location is between the existing facilities of the Staples’ Center, the South Hall of the Convention Center, LA Live, and the 110 Freeway. It bottles up a large large amount of “urban potential” – construction, pedestrian activity, economic activity, and spectator’s time – in an area already hemmed in on all sides – and easily “defensible.” Their proposal does the city no favors, as it only intensifies pedestrian activity to other AEG owned and managed facilities. What if they shared their profit-generation machine with the city at large? Building a stadium adjacent to the Transamerica Center would create a zone between the existing complex and the new addition that would become a tapestry of competitive (smaller) entertainment uses and economic growth. Surface level parking might even cease being the most profitable use of the land, and a new densification could occur. Proximity to more major streets into downtown also widens the range of public transit options that are near the area. And very importantly, a new eastern node of activity reaches the potential for private reinvestment in the vicinity to a much wider area than the urbanistically stingy AEG proposal. This area is a development zone, known by the city as the the “Figueroa Corridor.” That designation runs basically all the way from the south edge of Bunker Hill (eg: where most of the skyscrapers are) to Exposition Park 30 blocks south, and contains the entire area in question. Where for decades, literally all of the notable institutions along the “Figueroa Corridor” were to the West of the street, the growth of USC and the spread of its facilities to the East of Figueroa have rendered this an actual corridor, and provided a southern anchor for successful densification. The placement of a new NFL stadium to the east of Figueroa would be in the city’s best interests as an essential engine of development to extend this double-loading of the corridor back to the north, connecting it back with downtown and creating the kind of exciting “landscape” that Daveed’s proposal advocates. 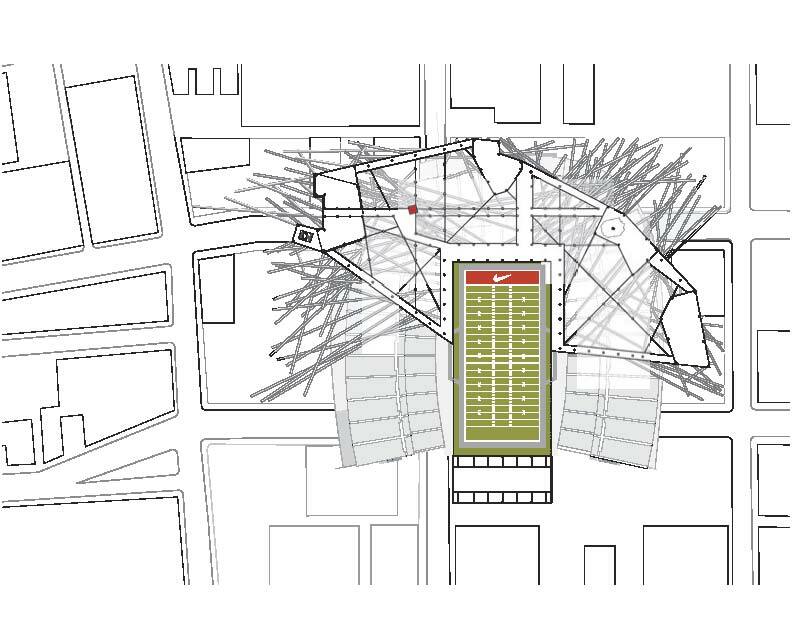 Hiding the NFL stadium where only AEG sees benefit would be an abdication of the public welfare and constitutes a tactical move of “chess board urbanism” that allows only AEG to benefit. Served by the soon-to-open Exposition Line, and along with all of the phenomenal institutions in Exposition Park, USC’s straddling of Figueroa including the state-of-the-art sports facility the Galen Center, the new private developments along Figueroa, St. Vincent’s and St. John’s Cathedrals, and the entire South Park Entertainment complex in question, an NFL stadium along the lines of Daveed’s proposal would be the major needed catalyst to form a new Miracle Mile along Figueroa. This would be an engine of economic growth and a beacon of world class status that says that Downtown Los Angeles has finally delivered on the promise so many see there. The worst part of the AEG proposal is that their type of pseudo-public space guarantees no rights of assembly or voicing opinion. This is a de facto erasure of these laws, as the public forum is basically being given to private interests just because they have the funds the city lacks to develop. The city of Los Angeles may be unable or unwilling to stop the large private interests like AEG from building huge landmarks of capital generation in lieu of proper civic spaces, but that doesn’t mean that they have to be ridden roughshod over by these companies. They could convince these developers that an unconventional plan is actually in their better private interests – which it is – and in better public interest – than the usual mediocre ideas. Just as even AEG’s deeply flawed and self serving downtown proposal is worlds better than the City of Industry proposal, Daveed’s seven year old proposal is worlds better than AEG’s. This is a call to arms to be brave and defy convention for once. Even if we can’t democratize the space of Downtown, we can build a transcendent entertainment district in Downtown LA truly worthy of worldwide acclaim.